Aug. 12, 2013 8:00 a.m.
On Wednesday July 31st the Leduc Regional Chamber of Commerce hosted an information session on Edmonton’s proposed annexation of a large section of the County of Leduc. Leduc County Mayor John Whaley presented the County’s position on the proposal and the affect it would have on the County and the City of Leduc if it were allowed to proceed as Edmonton has presented the plan. Mayor Whaley stated that municipalities have the right to grow, but growth plans should be done in a cooperative matter with neighboring municipalities not in an adversary manner. 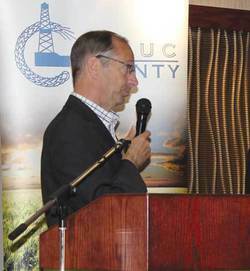 Mayor Whaley provided the audience a brief that showed the effect Edmonton’s annexation proposal would have on the County and the City of Leduc. The County would be looking at a loss of 17% of their tax revenue. This lost would result in a reduction of services to many of the communities within the county and at the same time there would have to be an increase in the tax rate to those areas remaining in the county. Meanwhile homes and business in the annexation area would see major increases in their taxes based on current Edmonton tax rates. Another factor is the agreement with the Edmonton International Airport, the County, and City would be lost. Currently that agreement generates 8.4 million dollars. Most of which goes to emergency services, Alberta Education, and the City of Leduc. About 10% of the revenue goes to the County. Mayor Whaley to say the least was very disappointed with Edmonton’s unwillingness to continue with the discussions the two municipalities have had over the past two years to resolve Edmonton’s quest to expand south to the airport. He indicated that Edmonton was the third municipality that has a desire for annexation part of the county in recent years. The County and the City of Leduc has an agreement for the City to expand to the west and is currently in collaborative discussions with Beaumont on a similar request. The County was under the belief that discussions with the City of Edmonton would have resulted in an agreement that would have met the needs of all parties concerned, but it seems that Edmonton has other ideas to what is a fair annexation processes. An explanation of the annexation processes was then provided to the members in attendance. The session then was opened to the audience to ask questions. One of the first questions was could the annexation processes be stopped? If a new administration wanted to stop the proposal they could rescind the proposal. Another question, which remained unanswered, was how did the joint planning go off the rails? Many wanted to know what public avenues they had to express their views. Attending open houses and attending hearings were some of the suggestions. One of the members of the audience was Edmonton’s Mayor candidate Kerry Diotte who indicated that he did not want Edmonton to appear as a bully and that any agreement should be a “win win” proposal. Meanwhile Mayor Candidate Karen Leibovici has gone on record stating the County of Leduc has been having a “free lunch” on Edmonton’s behalf and it is time to stop. The province has gone on record supporting a regional collaboration processes and even increased their grants in 2013 a year where Alberta slashed most budgets. The County hopes that Edmonton will reconsider and return to collaboration discussions in the near future.